Telemachus: Did 4 Years, 6 Years, 8 Years of Federal Stimulus Spending Under FDR 'Work'? Did 4 Years, 6 Years, 8 Years of Federal Stimulus Spending Under FDR 'Work'? 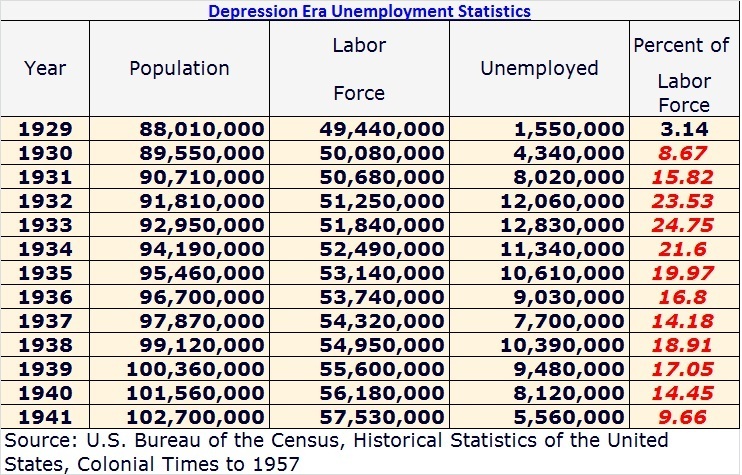 Well, since we are all thoughtful serious people who like to look at the facts first, let's take a look at the one and only really comparable time and period in modern American history that can compare to the current economic situation we are now mired in: The Great Depression from 1929-1942. I say that with great trepidation because what we have been through just doesn't deserve to be considered in the same ballpark as that Big One...the Granddaddy of All Economic Disasters. And then, as the cruelest consolation prize of all time, after they survived the Great Depression, the men of America got to go to a world war against one of the biggest monsters the world has ever known, Adolf Hitler and Emperor Hirohito and the bloodthirsty Japanese Empire. We have got nothing on them, ladies and gentlemen. They survived all that...and we can't get through this one? Give me a break. It will take a different course of action though than what we have seen these past 4 years, right? Since the economic conflagration of the 1930's is really the only thing to which we can compare this current Great Economic Contraction, we thought it might be helpful to take a look at what the massive Keynesian pump-priming of the FDR Administration did to 'stimulate' the private sector and get millions of people back to work lickety-split. In other words: 'Did the same economic theory of 'growing the economy' from the bottom-up and from the middle class 'work' in the 1930's to get the American economy humming again...ever? Take a good look at the chart above which is derived from the good old Census Bureau. There is more than enough data when you consider that FDR had the reins to government for 13 straight years. We are willing to concede that Republican Herbert Hoover and the GOP Congress did, in fact, handoff an economic meltdown of biblical proportions to FDR when he took office in 1933 which makes the Wall Street meltdown of 2008 look like a Merry-Go-Round next to a monster rollercoaster. The Wall Street Collapse of 1929 triggered the terrible economy of 1930, 1931 and 1932, all under President Hoover. So the 'bad old Republicans' had at least 3 years to clean up the mess and failed to do so with basically lassiez-faire policies that expected market forces to correct things for the better. It didn't happen. Even Mr. Fiscal and Prudent Conservative himself, Herbert Hoover set up the National Credit Corporation in 1930 which wanted the bigger banks to basically extend credit to the smaller banks, which they were reluctant to do. Sounds eerily similar to the first stages of the TARP program, doesn't it? The 'bad old Republicans' also passed the Reconstruction Finance Corporation in 1931 which set up the taxpayer-sponsored public agency in 1932 to issue loans to banks across the board to banks, railroads and even farmers. Who's to say that Republicans are doctrinaire all the time? They tried to do the top-down, government-control-of-everything route...and failed as well. The nation had enough of the Hoover Administration by the election of 1932 after 3 long years of failure. We are sure that President Hoover 'tried very hard' and was 'a nice guy' (sound familiar?) to boot. However, our grandparents and great-grandparents had had enough depression and wanted to try something different by 1932. So they elected Franklin Delano Roosevelt as President and gave him gaping majorities in the US Congress and Senate just to be sure everything he wanted to do got passed into law. Just to repeat: The US had already had 3 years of deep depression by the time FDR came into office and Hoover had already started to use the power of government spending and authority to try to turn around the economic fortunes of this country starting in early 1932. You would have thought that the economy might have started to show some signs of life by then, wouldn't you? 4 years is a long, long time. World War II was fought and won in about the same time that President Obama has been in the White House, as hard as that is to believe. After FDR took the oath of office on March 4, 1933, and the Democratic Congress started to spew out legislation authorizing expanded governmental power and involvement in the American economy, you would have thought that a year or so of their 'new direction' would have generated the massive economic recovery that typically accompanies the end of any recession, wouldn't you? Maybe by 1935 there should have been major improvement in the employment situation if pumping massive amounts of dollars into the economy from Washington 'worked real well', right? The unemployment rate was 20% roughly, down from 25% (look at the chart again). It would be extremely interesting to see just how much of this drop was due to civil service programs such as the Civilian Conservation Corps (CCC) all of which would have to be paid for by taxpayer dollars or increased borrowing. By 1937, it was heading down to about 14% so people must have thought that 'Happy Days Were Really Here Again!' as the old song goes. Wrong! Unemployment popped back up to 18.7% in 1938 after the Recession of 1937. For some reason, after all of the billions of dollars spent on the alphabet soup of government programs under FDR, the American economy was like that old car engine that sputtered and shook but just never 'turned over' and starting running smoothly again. The unemployment rate stayed at or above 14% for the next two years and only went under 10% in 1941. Then came Pearl Harbor and the underutilized United States industrial capacity was transformed into the most magnificent defense and war-making industrial machine the world has ever known. Unemployment plummeted to below 2% for the duration of the war. Our point is not to argue for another world war to come our way (although the Middle East isn't looking too safe right now, is it?) nor are we trying to say that we do not need any government involvement when things go south and really sour for the economy. What we are saying, though, is that the policies of the current Obama Administration, particularly the stimulus packages passed under the Democratic Congress from 2009-2011, have failed to generate any appreciable confidence in the private sector which then translates into increased economic activity, risk-taking and yes, job creation. We have tried it for the past four years and business confidence levels are still at very low levels relative to more normal times. Just like our grandparents and great grandparents 'tried it' for the first four years of the FDR Administration. And then, the second four years of the FDR Administration. Massive government spending and involvement in the American economy failed to get the United States out of the longest and worst economic contraction in modern American history over an entire decade of our history or about 7% of our existence as a nation up to that point in time in 1941. Anyone willing to roll the dice again with President Obama setting policy knowing that we could be in for another 4 years of the same policies that didn't work during these past 4 years? He hasn't said he would do anything different in a second Obama term, has he? You might as well just get used to another four years just like the last four years if he is re-elected. Just like your parents, grandparents and great-grandparents did before you.